This short essay was written for a publication accompanying the Visionary Structures exhibition at BOZAR, Brussels, opening in January 2015. In the early 1970s Environment occupied a central place in the lexicon of art and design on both sides of the Cold War divide. It was not, of course, a newly-coined term: more than a decade earlier American artist Allan Kaprow had described the settings of his early happenings as ‘environments’, spaces which entangled spectators in multi-sensory experiences. Kaprow and many others in the years which followed made works of art into which the visitor could step. Happenings, installations, Supergraphics, artistic interventions into the ordinary fabric of the city or the countryside, temporary architectural structures and monuments all came to be described as ‘environments’ (often using the English term). Although not new, the term seemed to gain a special hold on the imagination when electronic communications technology and new sciences like cybernetics augured new kinds of responsive environments. At the same time, these high-tech utopias were shadowed by growing anxieties about humanity’s negative effects on the natural world. This is certainly the case in the Soviet Union and the Eastern Bloc where artists creating ‘environments’ also faced a second constraint, namely that of the Party-State’s control over space. Despite trumpeting the collective ownership of all resources including space itself, state-censorship, surveillance and a paranoid approach to any form of unlicensed social gathering meant that the creation of works of art which formed environments – in the sense suggested by Kaprow – always risked official condemnation. In fact, the countryside became a particularly attractive setting in which to create temporary experimental environments in in the early 1970s because – in part – it offered some degree of escape from control and surveillance. 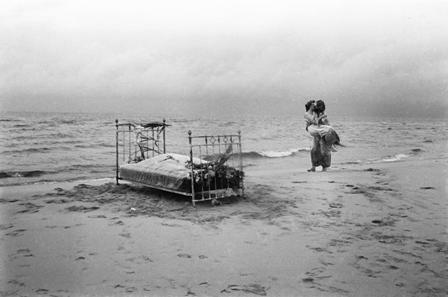 Key escapes of this kind include Andris Grīnbergs’ ‘The Wedding of Jesus Christ’, a two-day happening during which he married his partner Inta Jaunzeme in the Latvian countryside in 1972, as well as the better known activities of the Collective Actions group, cofounded by Andrei Monastyrsky in Moscow in 1976. Their ‘Journeys to the Countryside’ followed a general pattern: twenty or thirty participants would be invited by telephone to leave the city by an appointed train. On arrival, they would walk to remote field to be presented with a modest intervention into the landscape. In Appearance (1976), the first of these actions, the group were met by two men who distributed plain cards with the following inscription, ‘Documentary confirmation that _____ was a witness of Appearance which occurred on 13th March 1976’. 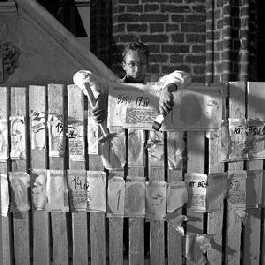 As artist Jānis Borgs recalls, one of the reasons ‘why there was no street art’ in the Latvian Socialist Soviet Republic until the late 1980s was because of the obdurate grip of censorship, at least until the Kremlin declared the policy of Glasnost (Openness). Early explorations of the idea of environment in Latvian art include a 1972 exhibition entitled ‘Celebrations’ held in the exhibition hall of the Institute of Scientific Technical Information and Propaganda in Riga. This event belongs to the longer and, as yet, unwritten history of scientific institutions forming welcoming environments for experimental art in the Soviet Union. In these settings, groups like Dvizhenie in Moscow and Prometei in Kazan synthesised art and technology to produce immersive, kinetic and abstract art works. In this way, forms of modernism which were prohibited by official art institutions thrived. In 1972 the elegant interiors of the historic Stock Exchange in Riga were filled with a framework of small interconnected bays conceived by Jānis Osis. Artworks by a new generation of modernist artists interested in testing orthodoxy illuminated these bays with light or sound or flooded brightly coloured stripes around their corners. There was little distinction between the art and its setting. In one section, the floor seemed to move and pulse under foot – here was a artwork which suggested interaction. ‘Celebrations’ was evidence that new forms of contemporary art like Op and Kinetic Art could be accommodated in an official exhibition which had been organized to serve a propaganda function (its title inferring the celebration of the formation of the Soviet Union fifty years earlier). But much depended on the strategic designation of the work: this section of the ‘Celebrations’ exhibition was categorized as ‘Interior Design’, a label which afforded artists greater intellectual and formal freedom than the conventional categories of art. An imprecise label like ‘artistic construction’ suggested usefulness, even if the nature of that utility was hardly evident to visitors in the gallery. Kinetic art formed a contact zone for ambitious art, architecture and design in Latvia. In 1978 designer Valdis Celms, architect Anda Ārgale and artist Māris Ārgalis, proposed that a ‘Lighthouse’ be constructed on the AB Dam on the Daugava river creating a new landmark for the capital in an otherwise anonymous section of the city. A ‘Centre for the Audiovisual Arts’, the tower was to feature a programmable, rotating video screen on which live events and propaganda could be broadcast across the city. Undeniably future-oriented (and exceeding the limits of Soviet technology at the time), the scheme was, at the same time, indebted to the propaganda stands and kiosks equipped with light panels and loudspeakers conceived by Gustavs Klucis in Lenin’s Russia. Never seriously considered by the authorities, this was nevertheless, an important project for the artists, one on which Celms worked for a number of years. In 1983 he completed a three-dimensional model of the lighthouse. The Lighthouse was first presented in ‘For One’s Own City’, a 1978 show which was organized in St. Peter’s Church in the centre of Riga to combine the creativity of artists and architects. Under the auspices of this exhibition, artist Jānis Borgs proposed departing the gallery by installing a clock on an empty plot in the city. His design was also indebted to Klucis’ ‘Dynamic City’, a montage from 1920 which combined a series of dynamic geometric forms with photographs of Lenin and pylon laid over a circular form suggesting the globe. Combining dynamic abstract geometry with Bolshevik symbols, Klucis’ image was a demand for world revolution. More than half a century later Borgs’ clock – reviving the aesthetics of the Soviet avant-garde – was to be a kinetic object set against a painted Suprematist supergraphic on the blind ends of the plot. In the Soviet Union where abstract art was still under prohibition, the avant-garde of the 1920s was yet to be rehabilitated. Only splinters of the history of the avant-garde were available to its citizens, and sometimes only then on the pages of magazines and books from the more liberal of the ‘fraternal’ nations of the Eastern Bloc like Poland. The wholesale rediscovery of the Latvian avant-garde of the 1920s was yet to happen. Moreover, the utopianism of this design lay in its unlikelihood of being realized in the stagnant conditions of the Soviet Union under General Secretary Leonid Brezhnev (this is what Theodor Adorno once called ‘negative utopianism’). 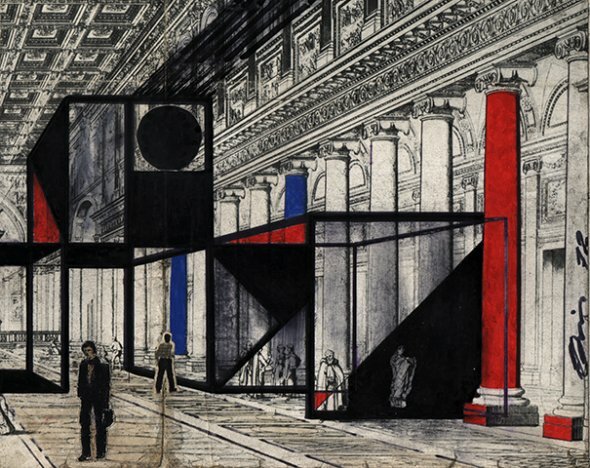 As such it might be considered an early form of what later became known as ‘Paper Architecture’ – a practice found across the Bloc but most strongly associated with young architects in Eastern Europe under communist rule who used visionary schemes as political commentary in the 1970s and 1980s. Artists and architects associated with the Tallinn School, for instance, produced an exceptional body of paper architectural schemes through the course of the 1970s which often used the vocabularies of Constructivism and Suprematism somewhat ironically: Leonhard Lapin designed, for instance, an ‘Anti-International Monument. 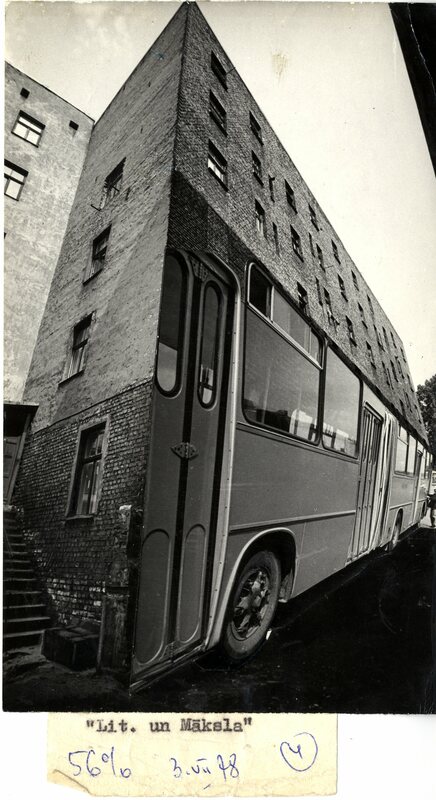 Tower (Stable) for Artist Valdur Ohakas’ Donkey’ in 1974, alluding perhaps to the primitive techniques employed in the construction of the first Soviet monuments – another form of Potemkin architecture. Just over a decade later Hungarian artist Gabor Bachman and architect László Rajk, with dissident writers György Konrád and Miklós Haraszti designed a visionary ‘Strikers House’ (1985) as a monument to the repressed Solidarity Trade Union in Poland in the Constructivist style. Both Lapin’s project and the Hungarian scheme were laced with irony. By contrast the Latvian engagement with the Soviet avant-garde still seems to possess a genuine desire for utopia. 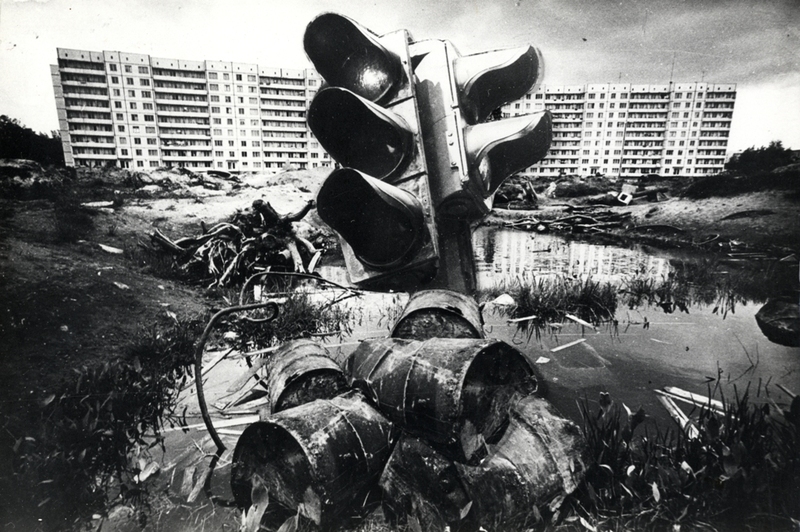 Ārgalis, Borgs and Celms – along with Kirils Šmeļkovs, Kārlis Kalsers and others – were also members of the Pollucionistu (the Pollutionists) group which in the late 1970s created a remarkable and extensive body of images which commented on the failures of late Soviet system to meet not just its promises of utopia but also its loud claims on beauty and utility. Walking through Riga, the Pollucionistu photographed new panel-construction estates and nineteenth century housing; side streets and back alleys; as well as the slow progress of repairs to the city’s streets. Their interests were neither in the historic landmarks of the city nor the ostentatious monuments to Soviet order which formed the conventional points on an official guided tour. Instead, it was the slow unmanaged entropy of the Soviet environment which drew their cameras. Pollutionists montage prepared for Literatura un Māksla, late 1970s. The group would bring their images to informal discussions in private apartments, often animated by Ārgalis’s penetrating reading of art theory and history. Celms and Borgs reworked these black and white images as montages or drew on their surfaces in the manner of Dada works. Often absurd, their images had limited circulation as grainy illustrations in Literatura un Māksla, a weekly paper issued by the artistic and literary unions in Latvia. Gentle humour eased the passage of these images through the censor’s office: nevertheless, viewed together, the images created by the Pollucionistu constitute a sharp critique of Soviet management of the urban environment. By the early 1980s, the activities of the group drew the attention of the KGB and, facing dark insinuations and intimation, dissolved itself. 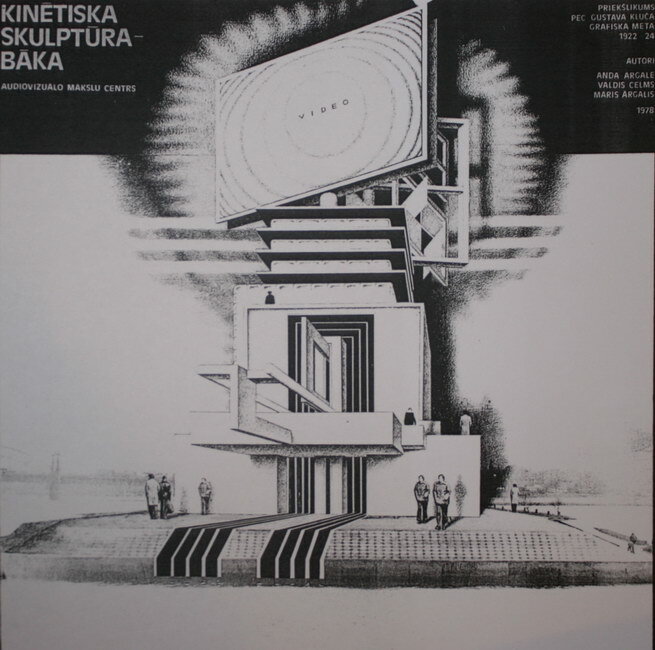 It is remarkable that Borg and Celms could be making montage works that self-consciously aspired to the irreverent qualities of Dada and yet at the same time were proposing utopian schemes like the Brīvības Street clock or the Lighthouse Audiovisual Centre. This was not, however, a matter of ‘Double Think’: both orders of image were hinged by a desire to radically improve the environment. Not anti-Soviet or explicitly political, they nurtured a desire for an alternative to that which was offered by Soviet reality. The late 1970s also marked the high-water mark of techno-utopianism in the Latvian Socialist Soviet Republic just as the tide turned to a new aesthetic which drew attention to entropy and stagnancy (one of the themes which the Pollucionistu recorded). A landmark exhibition, ‘Nature. Environment. Man’ planned by artist Ojārs Ābols but mounted after his death in St Peter’s Church in Riga in spring 1984 featured artworks not only by modernists like Celms but also those of a new generation of artists who addressed environment in very different terms: Indulis Gailāns’ ‘Fence Action’ was, for instance, a timber, whitewashed fence to which enigmatic messages scrawled on paper were nailed whilst Andris Breže (with Andra Neibuerga and Valdis Ošiņš) installed a putrefying Moskvich 401 car in which ghostly plaster figures were taking a ‘Journey to the Countryside’. Grass grew under its bonnet. In a new-found orientation to the past and to the countryside, these works anticipate the politics of ecology, memory and national revival which were to shape Latvian intellectual life in the late 1980s. The ecclesiological setting, as well the new-found interest in the entropy, brought ‘Nature. Environment. Man’ close to a series of exhibitions and happenings organized in Warsaw in 1983 and 1984. When artists in Poland boycotted official institutions in protest at the repression of Solidarity Trade Union, the Catholic Church provided alternative public spaces for dissenting culture. 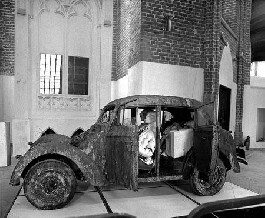 One particularly important space during the mid 1980s was a disused and ruined church on Żytnia Street which hosted a number of theatrical performances by banned avant-garde companies like Teatr Ósmego Dnia (Theatre of the Eighth Day) and works by prominent artists like Jerzy Kalina and Jerzy Bereś in group exhibitions with titles like ‘Znak krzyża’ (The Meaning of the Cross, June 1983) and the more open-ended ‘Obecność’ (Presence, June 1984). Whilst the Catholic church in Poland enjoyed an exceptional degree of autonomy and Ā, the sacred and historic setting served a new generation of artists interested in the subjective qualities and often suppressed conditions of memory. This also drew Latvian art closer – in approach – to the post-modern sensibilities which were shaping art practice around the world. History – so long the primary theme of most official art in the Soviet Union – was being rescaled to the dimensions of the family, the church and the home. 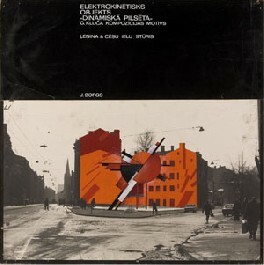 See for instance Aleksander Wojciechowski, ‘Environment w sztuce Polskiej’ in Projekt (March 1976) pp. 17-32. See Matthew Jesse Jackson, The Experimental Group: Ilya Kabakov, Moscow Conceptualism, Soviet avant-gardes (Chicago: University of Chicago Press, 2010) pp. 134-5. Borgs interviewed by Ieva Astahovska in Helena Demakova, The Self. Personal Journeys in to Contemporary Art: 1960s-80s in Soviet Latvia (Riga: Ministry of Culture of the Republic of Latvia, 2011), p. 67. See Deutsches Architektur Museum, Paper Architecture. New Projects from the Soviet Union (New York: Rizzoli, 1990); Alexey Yurasovsky, Post-Soviet Art and Architecture (London: Academy Editions, 1994). See Kurg and Laanemets’ essays in Keskkonnad, projektid, kontseptsioonid Tallinna kooli arhitektid 1972-1985 (Environment, projects, concepts. Architects of the Tallinn School 1972-1985) (Tallinn, 2008).